Dizygotheca Elegantissima- False Aralia or Spider Aralia- Family Araliaceae It’s origin is New Caledonia. 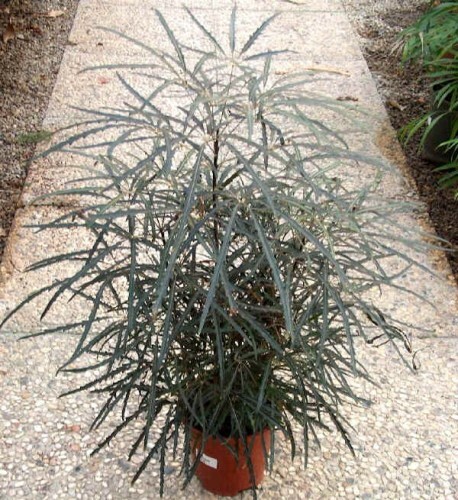 Indoors we find Dizygotheca elegantissima as a short, finely textured, bush-type plant in 6- to 10-inch pots. The dark greenish-brown leaves have saw-toothed edges. Plants have little branching and are usually planted as multiple plants. Flowers are green and white. An interesting feature of Dizygotheca elegantissima is its two types of foliage - juvenile and mature. Typically, you will find the juvenile foliage on plants in 14-inch (35 cm) and smaller containers. Larger plants in 14-inch (35 cm) and most 17-inch (40) and larger containers have leaves that are more mature. They are larger, longer, broader, lobed and more leathery. As the plant matures the trunk will become woody and have a larger caliper. It is not unusual for older, more mature plants have both immature and mature foliage at the same time. It grows well in a peat mixture and thrives in medium filtered light. It likes humidity so mist a few times if you lack humidity.